In the summer of 1970, I bought my first guitar – a chocolate-brown Harmony steel-string acoustic – and a songbook: Ramblin’ Boy and other songs by Tom Paxton. Here’s why I knew it. That 1964 Ken-L-Ration dog food commercial ran so often that anyone (including my then-10-year-old self) who watched TV at all back then soon had “My dog’s better than your dog…” permanently ingrained in his/her brain. I’d never thought about who wrote the song until I bought that Tom Paxton songbook. Tom Paxton recorded the song in 1962 on his first LP, I’m The Man That Built The Bridges. The album was an independently produced collection of live recordings done at the Gaslight Cafe in New York City’s Greenwich Village. Here’s “My Dog’s Bigger…” from that album. Having learned “My Dog’s Bigger Than Your Dog” from the transcription in Mr. Paxton’s songbook, I found the Gaslight Cafe recording rather surprising the first time I listened to it. Where were all the verses? In the songbook, there are eight verses, arranged in pairs. The second of each pair is an “Answering Verse” to the first, like two kids going back and forth, trying to one-up each other. Just to let you know, neither of these recordings of “My Dog’s Bigger Than Your Dog” is among the hundreds of songs/recordings by Tom Paxton that are available on iTunes! I was only able to find them as soundtracks to videos on YouTube. A search of iTunes for the song (by its title) did produce two cover versions of “My Dog’s Bigger Than Your Dog.” One was by Folk singer Peter Morse and the other by the duo of Leroy Inman & Ira Rogers. Mr. Morse’s version follows Mr. Paxton’s arrangement but, to my delight, the Inman & Rogers version – from an album released in March 2012, called The New Folk Generation – contains all eight verses (with only a few slight changes from the original, Ramblin’ Boy and other songs by… lyrics)! Hooray!! For some reason, when I taught myself how to play the song all those years ago, I made a rather substantial change to the chorus: I doubled the length of the rhythmic value of every note of the melody. What that means is: I sing every one beat, 1/4 note as a two beat, 1/2 note; every half-beat 1/8 note as a full-beat, 1/4 note. So, when I listen to Tom Paxton and Leroy Inman & Ira Rogers sing the song, the chorus sounds very rushed and rather diminished. P.S. 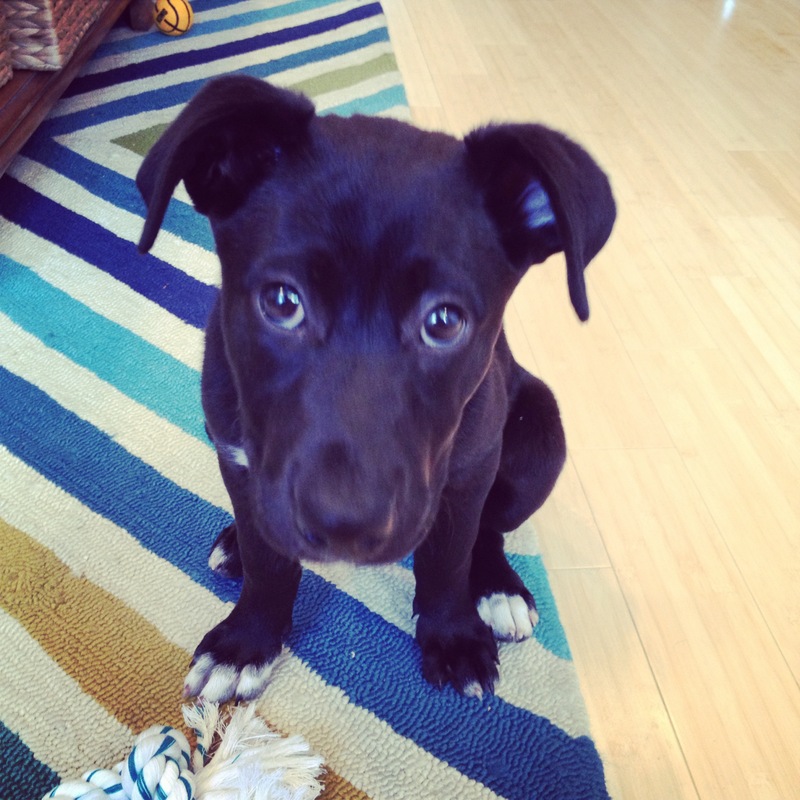 : This post was inspired by and is dedicated to Lutra, the newest member of our family. Lutra is the Texas-born, black lab/german shepherd puppy adopted on June 1, 2014 by my daughter and son-in-law down in Washington, D.C. This entry was posted in Posts with Video, Random Topics and tagged Ken-L-Ration, My Dog's Bigger Than Your Dog, Ramblin' Boy and other songs by Tom Paxton, Tom Paxton. Bookmark the permalink. Was that commercial really that long ago? (age denying reader). love it, dad! lutra says thank you and thinks there should be another verse that goes: “my dog’s cuter than your dog.” also, she wants belly rubs. That is one super cute puppy!